A disease that kills sea stars by dissolving their limbs and melting them into pieces has severely reduced the creatures' population in Alaska's Kachemak Bay in the span of a year. Sea star wasting disease, a type of densovirus, reduced the count of sea stars in Kachemak Bay from 180 last spring to a measly five this year, according to new numbers from researchers at the University of Alaska Fairbanks. "It's a huge drop," said Brenda Konar, a professor of marine biology at the College of Fisheries and Ocean Sciences at UAF. "They're such a prominent thing in the ecosystem, even visually, it's very odd. It doesn't look right anymore." The disease has been present in Kachemak Bay for several years now. The number of sea stars in spring 2016 was higher than other recent counts — 64 in 2015 in the subsections of the bay where researchers count, and 76 the year before. Only two species were represented this year, compared to seven last year. Researchers aren't sure why the number of sea stars has dwindled so dramatically. "I was expecting to see a lot more sick ones," Konar said. "I wasn't expecting to see none." The disease causes lesions on the sea stars (which are also called starfish, though researchers generally don't use that term because "they're not fish," Konar said), and their tissue then starts to decay. 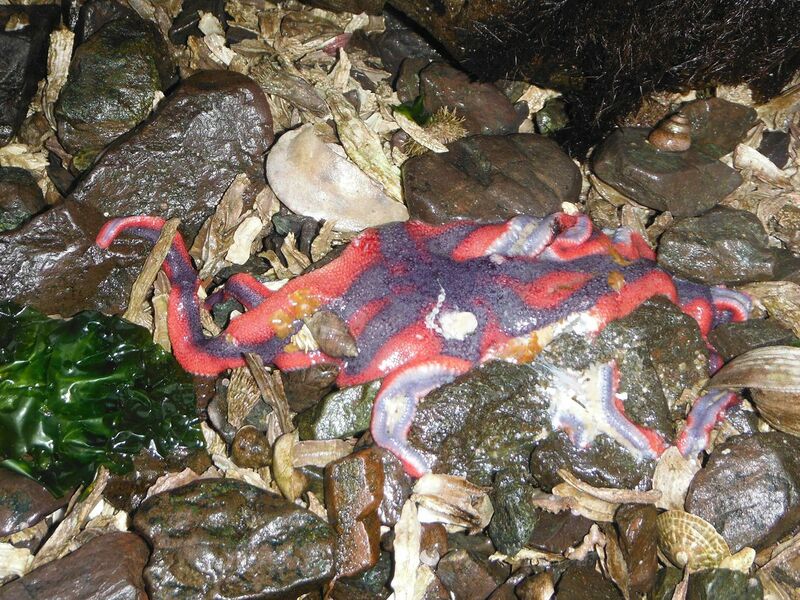 Sea star die-offs are not new. They have happened as far back as the 1970s in the Lower 48. A rash of sea star deaths from the virus on the West Coast of the United States around 2013 and 2014 spread up to Alaska. The disease is moving farther north as temperatures get warmer, Konar said, adding that the warm weather "Blob" from a few years ago had to do with how it got to the Last Frontier. Though the disease is not caused by warmer ocean waters, it is thought to spread more easily and progress faster in such an environment, said Konar and Kim Powell, a Homer-based ecologist and contractor for the U.S. National Oceanic and Atmospheric Administration. Recent years have brought the most significant number of die-offs from the disease ever, researchers say. "The issue is, it's really kind of an epidemic level," said Mandy Lindeberg, a fisheries research biologist with the National Marine Fisheries Service in Juneau. She's seen the disease affecting sea stars there too. "It's broken out and hit much bigger areas than usual." The impact to the ecosystem in Kachemak Bay is expected to be significant, because sea stars are generally the top predators in the marine environment there. They eat a lot of different things, including mussels and clams, preventing monocultures from forming. It's hard to say what the die-off will mean for how other populations grow there. "The trickle-down on what happens is usually really big," Konar said. "Maybe sea otters will just say, 'Ooh, more clams to eat.' It's hard to really predict. It may take a couple of years for that trickle-down to happen." Lindeberg said there's no monitoring for the impact of the disease around Juneau the way there is farther north in Kachemak Bay. She encourages citizens to call in and report if they're seeing wasting sea stars on the beach (her number is 907-789-6616), and document them by taking photos. "It will definitely be noticeable, not normal," she said. "They look all wasted, their arms are falling off, they're rotting, it's not a pretty scene. If you see a lot of them, count them. If there's just one or two, I'm not going to get excited, but if you tell me there's 150, I'm going to get excited." Some populations on the West Coast have started to recover, said Powell, noting that baby sea stars are beginning to crop up. That indicates that the population in Alaska can also recover, she said. "It's not necessarily a terminal situation," said Lindeberg in Juneau, "but there can be several years where they are devastated." Konar said that Gulf Watch Alaska, an ecosystem monitoring program funded by the Exxon Valdez Oil Spill Trustee Council and a group she works with for the annual counts, will also start sea star counts in the coming weeks in Katmai, Kenai and Prince William Sound.